About: Toast Enoteca & Cucina has created a delicious appetizer that's simple yet satisfying. 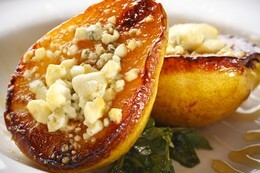 The Pere e Gorgonzola is a refreshing pear matched with sugar, Gorgonzola cheese, argula, and honey. Perfect as a stater for lunch or dinner, the Pere e Gorgonzola is easy to make and will satiate your taste buds. Cut the pear in half and with a small spoon clean the inside seeds, then cover the inside part with a layer of sugar and put the gorgonzola cheese on the center of each pear. Place them on an oven tray face up and in the oven for ten minutes at 350 f degrees and let the cheese melt. Take them out of the oven and in a plate put first the bed of fresh arugula, then put the pears face up and drizzle with honey. They are now ready to serve, buon appetito!